Sunshine x 3: Show & Tell: We have liftoff! Hello, hello, can you read me? I have had great fun the last few days sewing up Hottie Covers for the Hottie Project. 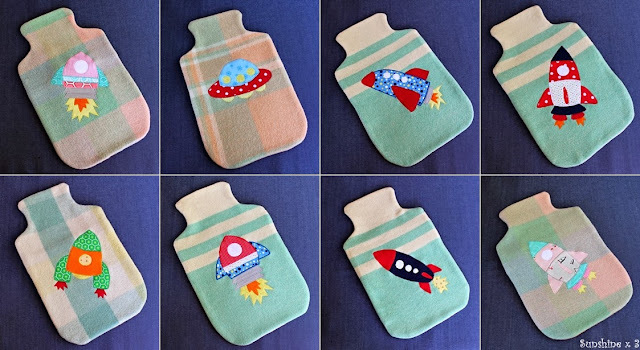 Whilst trying to dream up some cool ideas for boys ones, one of the girls started talking about spaceships.... aha! The internet was perused and some cool pictures were located. 400% enlargement later, they were the right size for our covers. Commence cutting hotties from wool blanket cutoffs, tracing rockets onto Visoflix, ironing onto fabric, cutting out, ironing onto covers, machine applique, some binding of edges and a final sew-around. Whoop! Man I loved making these. Those rockets really got me fired up - they were so much fun! Hopefully some little boys (and a couple of girls ; ) ) will love them even more than we do! What awesome projects have you been working on? Looking forward to seeing your makes or works in progress! Overachiever. I am seriously considering NOT showing you my ones now. Ha! These are awesome. I need to get some tips from you about how to appliqué. Love them all. These are awesome, and you've reminded me i can blog about our swap now! Love the wee rockets!!! I bet that these are going to be well loved by whoever receives them. These are seriously cool hottie covers. oh these are so so cute! They look great! I bought a sewing machine but never seem to have time to get on it! Super productive and super cool!